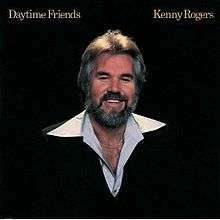 Daytime Friends is the third studio album by Kenny Rogers for United Artists Records, released worldwide in 1977. It was his second major success following the break-up of The First Edition in 1976 (his first album Love Lifted Me was a minor success, with his second, the self-titled Kenny Rogers, going to Number 1 on the US country charts and crossing over to the mainstream pop charts in many countries). The album produced two top 10 singles with the title cut reaching #1 on the country singles and tracks chart (and the top 40 in the UK pop charts) and "Sweet Music Man" (Rogers' own composition) reaching #9. Elsewhere on the album is a song called "Am I Too Late" which was not released as a single, despite Rogers later saying it was one of his favorite songs . Another track "My World Begins and Ends With You" was later recorded by Dave & Sugar, who had a hit single with it in 1979. The album reached #2 on the Country charts. ↑ "LP Discography: Kenny Rogers". LP Discography. Retrieved June 11, 2011. ↑ Whitburn, Joel (2008). Hot Country Songs 1944 to 2008. Record Research, Inc. p. 360. ISBN 0-89820-177-2.